What an amazing find. We are so blessed to have Ellie in our home. Ellie is a gorgeous F1-B (this means her father was a full blood poodle and her mother was a cross between a Labrador and Poodle.) She is so loving, Patient, tender, obedient and loyal. Ellie has been in our home a little less than a year, and has already firmly attached herself as a member of our family. She runs with her mom Tiffany (my wife) 3 times a week. When Tiffany leaves to do errands, Ellie waits patiently by the front door waiting and watching out the window for her to return. Ellie loves just being in the same room as Tiffany. She loves attention and will sit next to a family members chair and place her paw on their lap, asking to have their hand on her head, and to be petted. Ellie gave birth to 13 puppies on September 12, 2015. The father of these puppies is a majestic multigen** Labradoodle named Kona. Kona comes from a great line of labradoodles a line that has firmly established the great qualities of both, the noble and loving Labrador, and the hypoallergenic non shedding Poodle. Ellie demonstrates these qualities on a daily basis. These puppies are going to be amazing family members for some lucky families. They will be strong, loyal, loving, patient individuals that will be more family member than pet. The labradoodle breed, as demonstrated by Kona and Ellie is the pinnacle of family pet. These two animals have obtained the qualities that make living with us humans so compatible. They are loving companions that are easy to take care of comforting to have around, obedient, loyal, loving, tender and calm. On top of which their coats are soft and supple, fun to run your fingers through, hypoallergenic and non shedding. 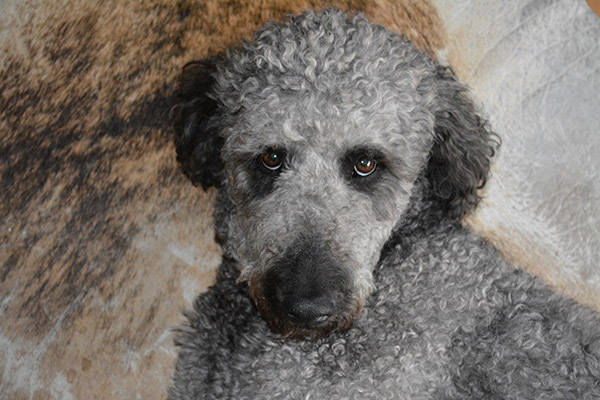 The labradoodle is a custom breed, and at Swann's Kennels, the following characteristics are what we desire to bring about as we create an amazing family member. **Multigen- Multiple generations of parents that are considered to be labradoodles. Kona is a 5th generation Labradoodle. 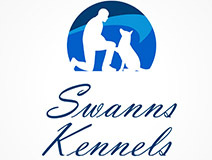 Having been carefully selected to bring forth the characteristics that Swann's Kennels desires. Rousy is a new puppy, a 16 week old female Boxer, a beautiful, extremely energetic creature, who loves to attack Elle. Elle's response to Rousy is with patience and tolerance. She is amazingly forgiving of Rousy and patient with us as we teach Rousy proper behavior. I'm proud of both girls as they interact with each other and our family.